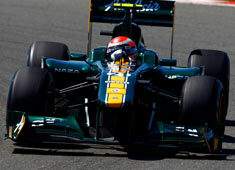 It was a pretty good Friday for all three Team Lotus drivers. Test driver Karun Chandhok had a chance to complete a reasonable number of laps, even though the weather made it a bit more difficult. The team used the time to gather some data on the wet and intermediate tyre, as any other testing was difficult. “We were not able to run so much today due to the weather, but in spite of this we were able to learn quite a bit about the engine behaviour in these conditions, especially on driveability and the cooling configurations of the car which is quite tight in the wet. The main challenge will be to work out the optimum fuel consumption for tomorrow because if it the weather dries up we have not run in dry conditions yet. It will be good for us to have an idea of that, so I hope it will be better in P3 tomorrow to make that a bit easier for us." "It is very good to be back at Silverstone where it all started for this team two years ago when Mike managed to get me into the paddock and we started talking about Team Lotus. The changes to the track here are fantastic, for me this is now the best paddock in the whole calendar so I would like to offer my sincere congratulations to the BRDC for having done such a great job on this historic circuit. On track, it was a reasonable day for us – I am not too sure how much we can take from the limited running we had but I am happy with the job that both the race drivers did today, and am pleased that Karun was finally able to complete a decent number of laps in FP1. He is a great asset to our team and we are very pleased to have him on board. I am also delighted to see the continuing development of Caterham Team AirAsia, our GP2 team who are setting very high standards in their first year. They have come together into a race-winning outfit extremely quickly and it is very exciting to see their continued progress from within the heart of the team."